Several Doctor Strange statues have been released from various studios. My personal favorite will always be the Bowen Designs full figure statue from 2005 by the Kucharek brothers. The sculpt is awesome. The way the cape drapes and the paint job make this a fantastic piece. The Doctor is also standing on a base with the Vishanti symbol on it. Another one of my favorites is the Thomas Kuntz Bowen statue. This statue features the Doctor from the waist up in a great pose with a great paint job. 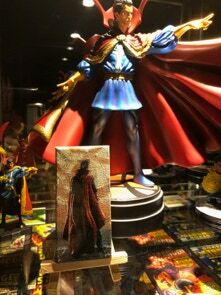 This section of the Archive features Doctor Strange statues. They can be made out of any material. Action figures and non-articulated figures are featured on other pages of the Archive. Use the mane above to navigate to other pages that feature other types of Doctor Strange Collectables.